from Mediterranean Street Food, pp. 166-67. My summer project of learning to grill over a charcoal fire continues. Eating all the lamb in freezer also continues. Both goals have combined to send me back to the cookbook shelves for further ideas. I noticed this one, which has lain unopened for a few years now. The title is what made me buy it. I love buying things to eat from vendors in the cities around the Mediterranean Sea where I’ve spent time. But I have to admit I can’t remember if I’ve ever before cooked anything from this book. In any case, I decided to divide the pound and a half of ground lamb in half, cook Helou’s Morrocan keft tonight, and try her Lebanese kefta or Claudia Roden’s kefta tomorrow night. A weekend-long workship on grilling ground lamb. Planning for tonight’s meal led me to a grocery that I’d heard about, doubted its existence and only discovered yesterday. Now that I’ve found the Mediterranean Market in north Sacramento, I can’t believe I’ve lived here eight years without it. It’s the only place in Sacramento I know of where you can buy various kinds of olives and French, Bulgarian, Greek, or Egyptian feta in bulk. The butcher is halel. It’s also the only store where I’ve seen fresh lamb tongue and sheep’s testicles. I’ll never despair of finding obscure Middle Eastern spices again. Helou calls for a Moroccan spice combination called ras el-hanout. It was dumb of me not to write it down, because of course by the time I found the store on Fulton Ave, I’d forgotton exactly how it went. Fortunately, a fellow customer at the cash register where I asked about it helped out. In addition to correcting my pronounciation with a laugh, he said it was just the Moroccan Arabic word for Allspice. I have a feeling not Allspices are Allspices, so even though I had allspice at home, I bought twenty-five cents worth. Preheat the broiler to high or start a charcoal fire. Put the onion and herbs in a food processor and process until very finely chopped. Transfer to a mixing bowl and add the ground lamb, spices, and salt to taste. Mix with your hands until evenly blended. Divide the meat into 24 equal portions. Roll each portion into a ball and wrap it tightly around a long skewer, preferably a flat one, squeezing the meat up and down to form a sausage 4 or 6 inches long. Pinch it quite thin at each end. Prepare the rest of the meat in the same way. Cook the brochettes under the broiler or over a charcoal fire for 2-3 minutes on each side, or until done to your liking. Serve immediately with good bread and the tomato and onion salad. I liked the promise of Helou’s spices, so I followed her instructions — almost. Since the man in the market translated ras el-hanout as “allspice”, I decided to dispense with the allspice. How do I know Anissa Helou knows what she’s talking about when it comes to spices in Arabic? One allspice dose is enough. But when it came to the meat, I followed the legendary Claudia Roden, who in a little contribution to Splendid Table here, recommended turning the meat into a paste in the food processor. So, I did that. No doubt about it, the processed onion, herbs, and ground meat becomes a paste. I added the spices. I made a hot fire of coals, which I spread over half of the bottom grate. I then put the upper grate on so that the grill ran perpendicular to the half-filled bottom grate of coals (see image above). When the coal had died down a little, I put the skewers on perpendicular to the grate (again see image above). I’ll tell you about the peaches in a minute. Two minutes on each side for the kefta was plenty. I let them rest a little longer, because I was dealing with the peaches, and I regret it. The trick, I know see, is to get them off before they dry up. Kefta apparently dry up rather quickly. After 4 or 5 minutes, I took them and the peaches off. The peaches. My peach tree has turned out to be a magnificent beast. It produces deep yellow, firm-flesh, sweet fruit. Right now, I have a lot of them. So, I found a quick recipe for a reducation sauce on line that I used. I’ll give the proportions I used. You can double them. While the coals are burning in the chimney, cut one peach in half. Squeeze lemon over it. Reduce to a syrup. Take out to the grill. When you’ve put the kefta on the grill, put the two halves hollow side down on the grill on a cooler part of the grill but still near enough over the coals to feel the heat. When you turn the kefta, turn over the peaches and brush them with the reduction. 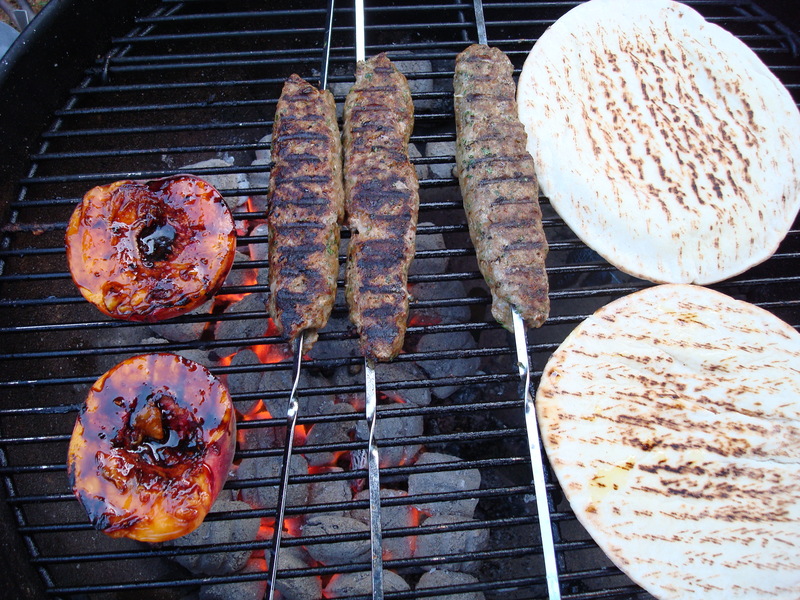 Let them grill for a minute or two longer than the kefta. I see now that the important point is to avoid drying out the kefta. I’d also slightly adjust the spices upward, except for salt. Maybe it does need an extra kick of allspice. On the other hand, maybe all those spices are overkill. The only spices Claudia Roden calls for are parsley and onion. Maybe she has a point. I’ll consider that tomorrow.